I’m glad to announce that Converseen 0.9.6 now supports ImageMagick 7, the newest branch of the open-souce image manipulation suite. Converseen is an open-source batch image processor for Linux and Windows, developed by me, that allows the user to apply automatically some operations on large groups of images. As instance, you can manage to resize, compress and change the format of a bunch of images before using them in your web pages. 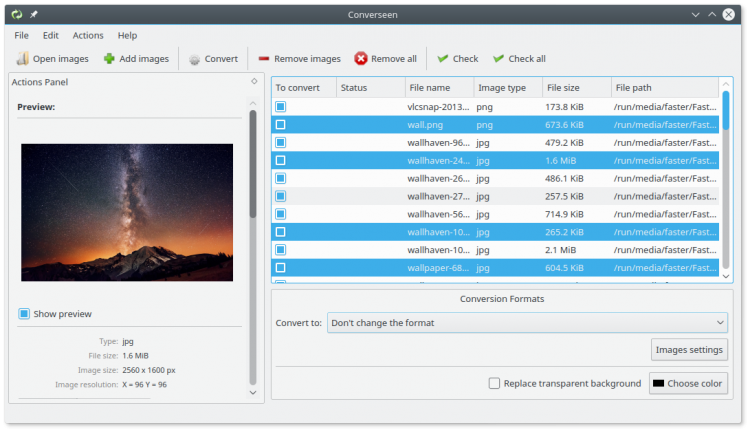 Of course, Converseen shows off some interesting features like pdf-to-image conversion, a huge number of supported image formats and a set of resizing filters that allows you to shrink your photos using the most suited algorithm for a particular use case. This new release of the program supports both the version 6 and 7 of ImageMagick. If you are going to compile Converseen on your Linux machine, the cmake command will automatically include the headers and libraries of your installed version of ImageMagick during the build process. For more informations on how to compile the program take a look here. From now on, the Windows binary packages will include the latest version of ImageMagick 7. You can download/clone the source code of Converseen from here or from GitHub. Converseen is also available in the most common Linux Repos (Ubuntu, Fedora, Arch Linux, etc) so, take a look here to learn how to install the program in your Linux machine. Converseen is also available for Windows and you can download the installer or the no-install packages from here.